Wood second baseman Sean Kelly closes in on a ground ball and easily gets the out at first. When anticipating a baseball championship, no matter what the score, those last three outs can’t help but wrack the nerves. Heading into the visiting seventh inning, Wood led, 3-0, and Neumann-Goretti didn’t appear to possess a smidgen of momentum. On the mound for the Vikings was junior Joey Lancellotti, who was in the middle of a one-hit shutout and showing no signs of slowing down. Lancellotti’s approach? Just keep doing what got him to that point. Defending champion Neumann-Goretti, however, has captured four titles in the last seven years for a reason. The Saints never believe that any deficit is too large to overcome, no situation too overwhelming to toss in the proverbial towel. So, despite Lancellotti’s dominance, it wasn’t too surprising when the Saints began to resurrect. By the time it took someone to sprint to the snack bar for a pretzel and soda, the Saints suddenly cut the deficit to 3-2 thanks to a run-scoring double by Nick D’Amore and a follow-up triple by Brian Verrati. A hit batter later, N-G had runners on the corners. Asked later if he had thought about replacing Lancellotti (7-0 record this year) with a reliever, Wood coach Jim DiGuiseppe Jr. simply said that it was Lancellotti’s game to win or lose. 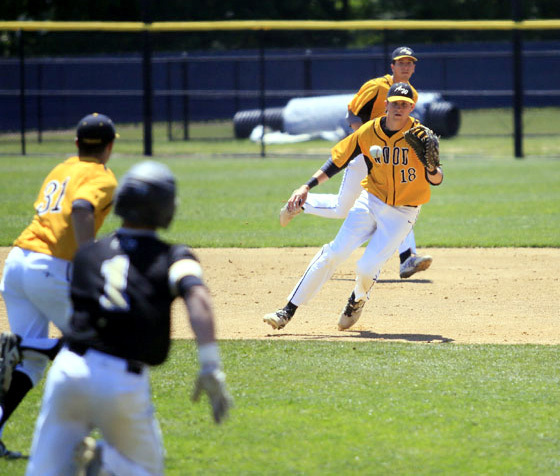 With the Wood fans barely able to look while the Neumann-Goretti crowd could not have been much louder, Lancellotti’s next pitch was lined toward second base. In an instant, Matt Cummiskey snared the ball in mid-air and fired to first baseman Sean Kelly (two hits and two runs scored) for a championship-inducing double play. And just like that, Archbishop Wood had its first Catholic League title since 1993.